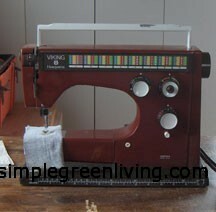 My sewing machine wouldn’t work. Well, it would after a fashion. I could sew a straight stitch backwards. That wasn’t exactly what I had in mind when I bought my Viking 6460… what, over 30 years ago? REALLY? You mean it’s an antique? What does that make ME? All those colors you see across the top represent different stitches. I have my favorites, and a while back I wanted to do some mending with some of those stitches. That’s when I discovered that I couldn’t. Not to worry, the same thing had happened years earlier and a fabric store had fixed it by giving the machine a good oiling. So we took the machine, all 40 pounds of it, back to that store, which had changed hands in the meantime. Weeks later, I got a phone call that they couldn’t fix the machine. They couldn’t even figure out how to get into its core. This Swedish-made machine, made by Husqvarna of chain saw fame, is one sturdy thing and it isn’t meant to be oiled by the home user. So I guess it wasn’t evident how to get into it. So we brought it home and it took my handy husband five minutes to have it apart. He oiled it thoroughly but it still didn’t work. Over about a week, he spent a few minutes now and then testing to see if it worked, saying what a good machine it was, and finding more places to oil. And he got it to the point where I could sew a straight stitch forward and backward. Progress! I knew from my online research that a lot of people have old Vikings, model 6460, that only do that, and they use them quite happily. Kelly thought maybe I would be satisfied with his success. But no, I really wanted to do three-step zig zag and some of the fancier stitches. 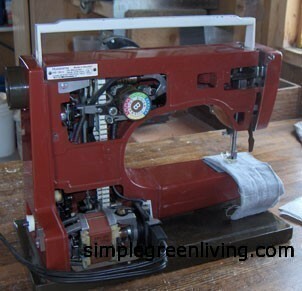 I said in any case we would keep this machine for heavy-duty sewing, as its low gear is phenomenal, but I had read online that people had oiled their machines and that had been all it took to get everything working. And indeed that had been our experience about 10 years ago. Of course, in the meantime we had lived in Mexico for five years and the sewing machine had languished in a storage unit in the heat and the cold of Colorado. That store had new owners who knew less than the original ones! Nice to hear from Sweden. Yes, I think you will find the pattern knobs. Good thing the machine in in your hands for care! Congratulations to the working machine! That store appears ignorant for not knowing how to handle the machine. They probably just wanted to sell you some new plastic crap… These old workhorses are really underrated. I live in Sweden and I have exactly this machine. I found it recently in the garbage. Today I tried to see if it would work properly so I took it apart. I just first needed to look online to see which screws to remove. Some parts inside were a bit rusty and the mechanics was a bit stubborn, but the engine runs. I think It just needs some lubricating. But then suddenly something inside it started to burn! But it was just the engine capacitor which is cheap and easy to replace. I think this machine will have a promising future! I don’t have the “pattern knobs” though, but I think I can find them quite easily.